« Sermonette: Should Mark 16:9-20 be in the Bible? Venezuelan Socialist party leader Diosdado Cabello said Sunday that a “terrorist” attack had taken place at a military base in the central city of Valencia. Troops acted quickly to control the “irregular situation” at the Paramacay military base, Cabello, a supporter of President Nicolas Maduro, said on Twitter. The announcement came after a video was posted online early Sunday, showing men in military uniforms, some of them carrying assault rifles, declaring a rebellion against Maduro in the state of Carabobo, where Valencia is located. Despite months of violent protests against the measure, Venezuela’s controversial Constituent Assembly was inaugurated Friday. The assembly is expected to rewrite the constitution and give new powers to the ruling Socialist party. 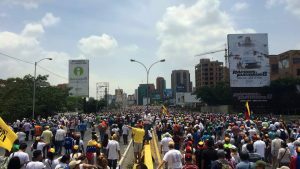 It happened in Valencia in Carabobo state in the country’s north-west. A video circulated on social media of a uniformed group calling themselves the 41st Brigade. The latest election in Venezuela was considered corrupt by many observers. Some have apparently chosen violence to show their disapproval. This entry was posted on Sunday, August 6th, 2017 at 7:30 am	and is filed under Doctrine.